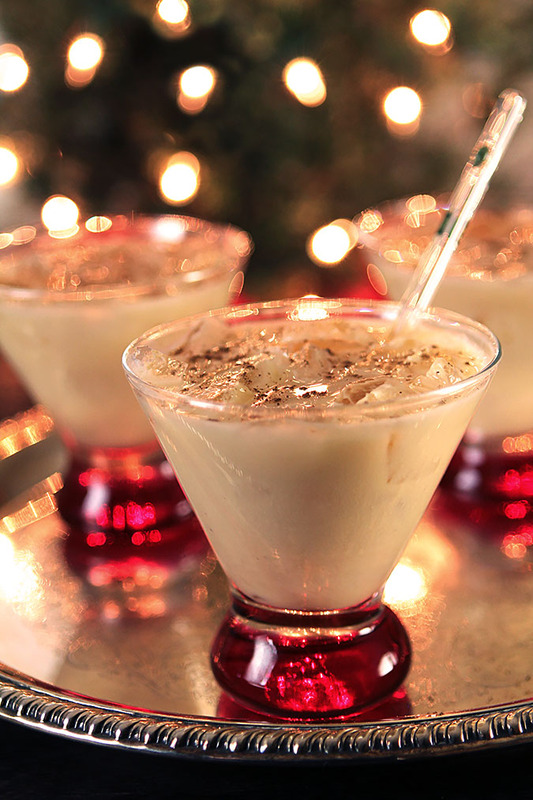 Looking for a holiday cocktail that will spruce up your eggnog? 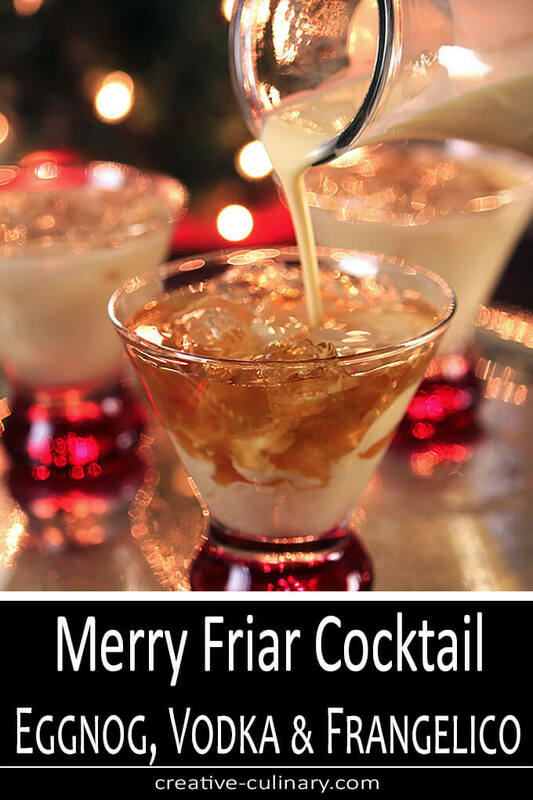 The Merry Friar Eggnog Cocktail with Vodka & Frangelico will do just that with a hint of Espresso thrown into the mix too! I love eggnog; always have. I can remember the combination of eggnog and my Grandma’s pecan butter ball cookies as a Christmas Eve tradition when I was a young girl so it’s been a longstanding love affair and a tradition I’ve kept alive my entire adult life. I’ve also been pouring a bit in my morning coffee the last few days as I’ve finally got some holiday decorations up and am getting ‘into the spirit’ and nothing quite speaks to me of Christmas like eggnog. Especially eggnog with a bit of a kick. It’s good in coffee but it’s better with booze! Every year about this time I start thinking about what kind of eggnog cocktail I’ll make. It’s a lot like cranberry sauce at Thanksgiving; I want to create a new recipe and have a new libation, not one I’ve already done before. Because of my passion for coffee and eggnog in the morning I thought it would be fun to do a cocktail with some caffeine too; just a little bit. Not enough to wonder why I’m still awake at 3am but enough to boost the flavor profile I was looking for. First, I love Frangelico. I love the flavor of Hazelnuts and I smile every time I pull out that bottle with the look of a monk with a rope belt tied around the middle of the bottle. Hence the Merry Friar; I know after a couple of these those monks would be smiling too. I loved using some Hazelnut Coffee Liqueur as it allowed me to lessen the Frangelico a bit, knocking back some alcohol content without sacrificing the hazelnut taste. I’m in the holiday hosting mood and I like to keep an eye on every drop. I want guests to have a great time but I also don’t want to have to drive them home! Even though considered a product for sweetening coffee; for me it’s multipurpose; it’s perfect for cocktail making too. Win-win right? The espresso touch was minor only because I didn’t want every one of my friends to call me the next day, grouchy that they hadn’t slept so I proceeded with caution. I love using an Italian dry espresso powder and each cocktail only has a half ounce of coffee. Unless they imbibed WAY too much; sleeping was not going to be a problem but the addition was a flavor boost I loved; not a coffee cocktail at all, just a really good one. Rounding out this mix and adding just enough burn to know this is a real libation was the vodka. Use a decent vodka; this is for a holiday event, not a dorm party! 🙂 Almost last but certainly not least was the eggnog. This is certainly personal preference but I use a local product from Royal Crest Dairy. It is amazing; so thick and rich that I cut it with a bit of milk usually. So buy or make what you love; once you mix it with other components I assure you it will taste great. All mixed together with a dusting of nutmeg and the end result was perfection. Definitely sweet so something to be served as a dessert cocktail but with a nice warmth from the vodka. Though not technically a warm cocktail; that subtle hint was enough to warm me, that’s for sure! I dust mine with nutmeg but you can use cinnamon or nutmeg or both. Or neither. It’s all good. Happy Holidays! 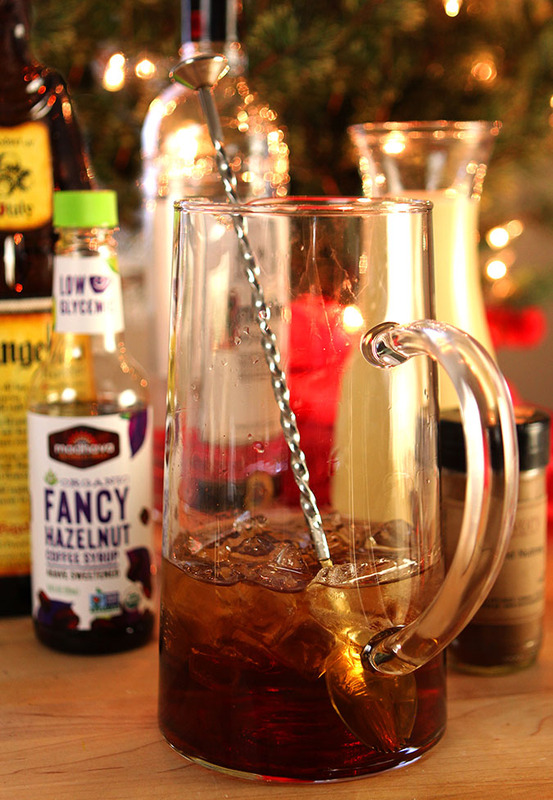 Combine Frangelico, coffee, the hazelnut coffee syrup and vodka in a pitcher or shaker with ice and stir or shake until cold. Pour into ice filled cocktail glasses and top with eggnog. Stir. It’s all available online too Patricia if you can’t find it locally. I am SO thrilled to see this post!! I love these options and am going to buy everything I see!! Ooooh, salted caramel sounds divine. I would love to try all of them but salted caramels are a real soft spot so I imagine it would be my favorite. 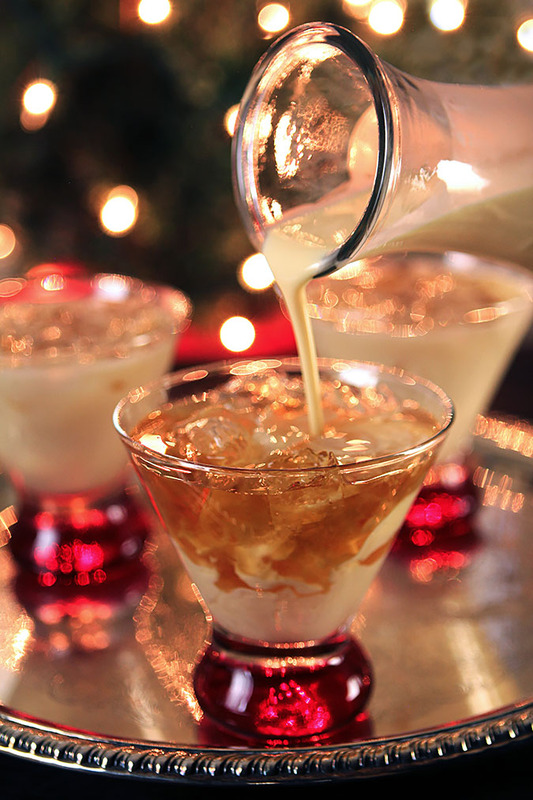 I still remember the first time I was allowed to have a touch of rum in my holiday eggnog – it was a big day! If a certain cocktail could be labeled as the comfort food of beverages, this would be it. What a fantastic holiday treat! What a fun way to sweeten drinks for the holidays! Love that there are so many flavors! Frangelico is my all time favorite liqueur and the flavor combination in your Merry Friar sounds divine – pun unintended, but fitting 😉 Happy Holidays, Barb! Oh, I absolutely love eggnog. And now I’m very thirsty! This drink sounds awesome. I cannot wait to try this product and the cocktail! This is my introduction to Madhava products, and I cannot wait to order some! Thank you, Barb! You create some of the most decadent cocktails! I love the coconut palm sugar from Madhava and use it for baking. Just love the flavors. Haven’t tried other products from them. I didn’t even know they had syrups!! I have not tried any of their products but would love to try the Whipped Cinnamon Honey. Oh you have been busy making tasty drinks!! I stumbled upon this Colorado company earlier this year when Whole Foods shared the Whipped Cinnamon Honey with me– SO GOOD. I would love to try their other products and will have to look for these syrups first. I’d love to try the coconut sugar and the The Merry Friar, yum. Your pictures are absolutely spectacular. I love the name of this drink. Anytime you can use the word merry and it’s not Christmas – that’s the one for me. I am now following on facebook! Your drink looks fantastic! I would love to try it! No I have not tried any of their products but would love to!The brownie mix sounds great as well as the coconut sugar!